Historic production from 1903 to 1983,is reported to be in the range of 4,228 tonnes (4,660 tons), averaging 5.35g/t Au (0.16 oz/ton), 227 g/t Ag (6.62 oz/ton). Data for lead and zinc are incomplete for the range of years but historic information indicates 49,462 kg lead and 26,243 kg zinc were produced up to 1977, giving average calculated grades of 2.0% lead and 1.1% zinc. Production of 894 kg copper in 1983 was also reported. Although in excess of ten veins have been located to date, almost all past development has been restricted to just two principal veins. 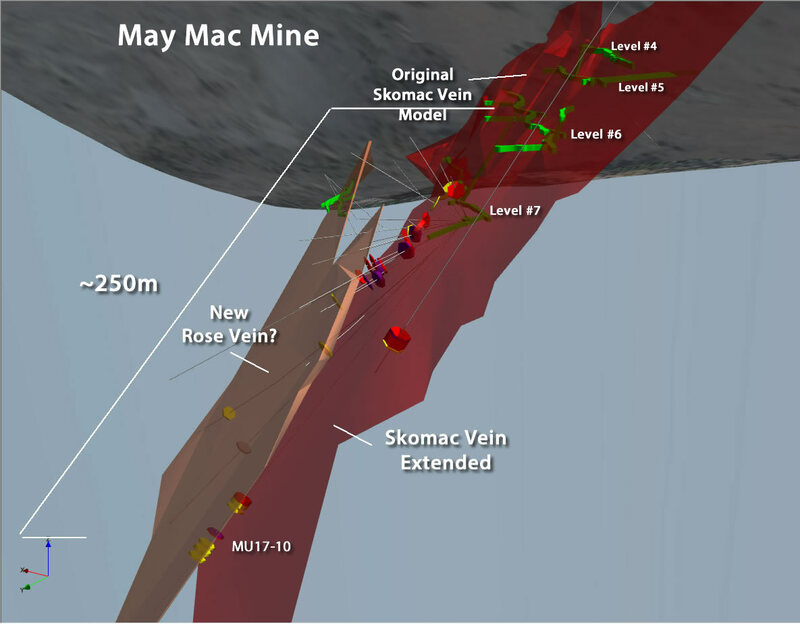 The May Mac mine is currently being prepared to supply feed to the Greenwood Process Plant. A surface diamond drilling program is currently underway. The initial underground drilling program has been successfully completed. A permit application for underground drifting and drilling is currently under review by the BC Ministry of Energy and Mines, and an updated bulk sample permit application is being finalized. 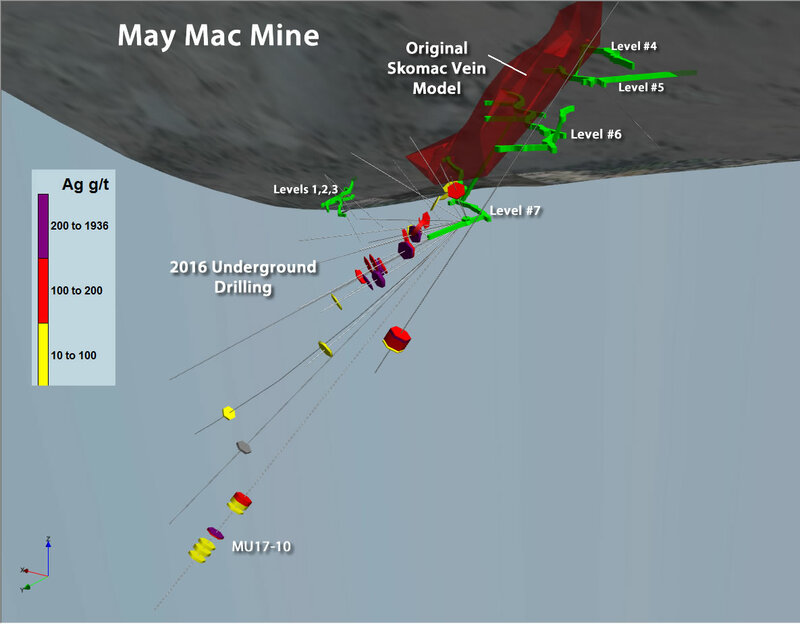 An exploration target has been projected for the May Mac mine based on the updated geological model. The target ranges from 200,000 to 600,000 tonnes in size at an estimated average grade of between 100 and 400 g/t Ag, 1.5 to 5.9 g/t Au, 0.7 to 3.0% Pb and 0.3 to 1.9% Zn, based on historic results. Note: The potential quantity and grade of this Exploration Target is conceptual in nature; there has been insufficient exploration to define a mineral resource and it is uncertain if further exploration will result in the target being delineated as a mineral resource. 1.48 g/t Au, 124 g/t Ag, 0.19% Cu, 1.29% Pb and 1.48% Zn. Gold: Gravity recovered 49% Au, and flotation a further 49% into a bulk sulphide concentrate, resulting in a combined gravity and flotation recovery of 98%. Silver: Gravity and flotation recovery for silver was 97.7% of which 4.7%, reported to the gravity concentrate. Overall, the initial results show very good bulk flotation recovery for precious metals following the flowsheet of the existing treatment circuit at the Company’s 100% owned Greenwood mill. Flotation cleaning will now be tested in order to make a higher grade concentrate for sale. Optionally, cyanide leaching results after 48 hours retention indicate approximately half the silver was recovered, and with a gold recovery of 90%. The results indicate that precious metals can be efficiently recovered from the May Mac mineralization using gravity and flotation treatment. The Company’s 100% owned Greenwood Processing Plan and located approximately 15 km east of the mine, is capable of producing such concentrates. This supports the Company’s intention to supply mill feed from the May Mac Mine to the Greenwood mill, without having to perform any major modifications to the existing treatment facility. The underground drilling intercepts from 2016 and to date for 2017 indicate that the Skomac Vein System is mineralized beyond, above and below the #7 adit, i.e. along strike and up and down dip. Significant silver-gold mineralization has now been identified approximately 70 meters to the northwest, 20 meters above, and 120 meters below the #7 adit. Note: The Skomac Vein Extension diagram shows the extent of preliminary geological models of the Skomac vein system. This model is subject to change as new drill information is added. Samples reported above were collected under the supervision of Dr. Mathew Ball, P.Geo. and delivered to Activation Laboratories (Act-Labs) in Kamloops, B.C. Act-Labs is an independent commercial laboratory that is ISO 9001 certified and ISO 17025 accredited. Analyses for gold were by the fire assay method using 30 gram samples with an ICP-OES finish. Duplicate gold analyses were performed on samples containing abundant visible sulphide mineralization. Silver and other elements were analyzed by ICP-OES using a near total, four acid digestion. Results above 100 g/t silver were re-analyzed in duplicate by the Fire Assay method using a 30 gram sample. Samples containing significant visible lead and zinc mineralization were also analyzed by assay grade, Peroxide Fusion assay for Pb, Zn and Cu. Quality control was monitored using reference and blank samples inserted into the sample sequence at intervals.